Peter Nicholas Rateng’Oginga Ogego serves as Kenya’s Ambassador to the United States. He presented his credentials on September 5, 2006. 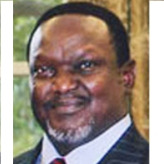 Ogego holds a bachelor’s degree in political science and international law and a master’s degree in public organization and management from Makerere University in Uganda, as well as a graduate certificate in development law, human rights and social justice from the Institute of Social Studies in The Hague. He served as the Kenyan High Commissioner for Canada and as ambassador to Cuba, and held several postings in the Office of the President, including Commissioner of Special Programs, Vice Chairman of National Disaster, and a member of the Emergency Response Committee. In addition, Ogego was a consultant for various organizations in Nairobi, including donor agencies, the Development Communication Institute, the Centre for Institutional Development, Research and Consultancy Services, and the Social Development Network, as well as the lead consultant for Strategic Public Relations and Research Ltd.
Ogego was also the consulting director for the Jaramogi Oginga Odinga Foundation—an indigenous development charitable organization focusing on HIV/AIDS and poverty—and coordinator for the Nyanza Professional Caucus, an association of volunteer professionals from the Nyanza province. Since the controversial relations in 2006, Ogego has since transferred his concerns to deepening the relations of the countries instead of focusing on the past debates. Ambassador Ogego has not yet apologized to Obama or corresponded with him since then.